TS Eliot, The Waste Land. Part of a pioneering new exhibition, ‘April is the Cruellest Month....’ inspired by T.S. Eliot’s poem The Wasteland, which brings together contemporary artists and scientists within Cambridge University’s new ArtCell exhibition space. Fernan Federici with the Mayor of Cambridge, Sheila Stuart, at the opening of the exhibition. Featured artists/scientists: Cinnamon Heathcote­-Drury, Stefanie Reichelt, Jim Haseloff, Fernan Federici and Andrea Baczynski. International fine artist and portrait photographer, Cinnamon Heathcote­-Drury presents a photographic collection of whole plant and vegetable specimens know to be vested with beneficial healing properties. Enormously enlarged and displayed as black and white architectural forms, this monumental series invites us to look closer at the extraordinary variety of shape, texture and contour that these vegetables offer in their natural state, when usually found supplied to the UK in powdered or dried form. Heathcote-­Drury’s style pays tribute to Karl Blossfeldt’s simple, anatomical hedgerow specimens from the 1920s, shot in large format monochrome, using natural light and without crop to enhance impact or effect. They are dispassionate records, not necessarily beautiful yet highly arresting, offering an almost 3‐dimensionality via the choice of depth of field, and rich in tone resembling ancient etchings. Heathcote­-Drury also displays new work from her expanding series of colour portraits, in which women from all over the world present themselves to the camera, holding vegetables as flower arrangements or offerings. By contrast, Stefanie Reichelt offers a closer look at nature’s construction of vegetables and fruit. MRI scans of plant material, kiwi fruit and other vegetables are displayed as small video pieces taking us on a microscopic journey through the eye of technology. Reichelt is both artist in her own right and leader in her field of scientific imaging and light microscopy, carrying out world‐class research to improve our understanding of cancer and find out how to prevent, diagnose and treat different kinds of the disease. 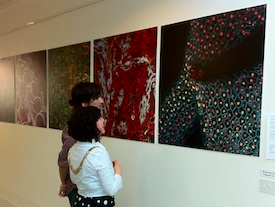 Reichelt founded the ArtCell exhibition space, located within the Cancer Research UK Cambridge Research Institute (CRUK CRI), with the purpose of bringing art and inspiration to other scientists, patients on site at Addenbrooke’s Hospital, as well as demystification and/or intrigue to the general public. Going one step further, Jim Haseloff and Fernan Federici’s amazing prints of fluorescent protein labelled transgenic plants, stained whole‐mounts and 3D reconstruction of plant cell anatomy, offer an other‐worldly beauty to contemporary microscopic cellular plant examination. Various staining techniques are used to label DNA, proteins, carbohydrates etc., and the digital controls of a confocal microscope allow for the clean separation of different fluorescent emission signals and the balancing of signal levels in different channels, leading to the production of images with intense clarity and colour. Based in the Department of Plant Sciences at Cambridge University, the Haseloff Laboratory is pioneering ‘synthetic biology’, and has constructed a series of tools for controlling gene misexpression, and marking specific cells in growing plants. The lab is building a new generation of genetic circuits that incorporate intercellular communication, and could be used to generate self‐organised behaviour at the cellular scale. These kind of circuits and cell‐cell interactions play a key role in plant development and morphogenesis, and synthetic circuits will allow bold new approaches to reprogramming plant systems. Synthetic Biology is an emerging field that employs engineering principles for constructing genetic systems. The approach is based on the use of well‐characterised and reusable components, and numerical models for the design of biological circuits. Andrea Baczynski explores plants and their mystery via underexposed black and white bromide prints. These brooding images offer space for intense psychological connections. In her series The Nature of Light, Baczynski worked with plants and the light waves bending around obstacles. She continues her fascination with nature through this visual exploration of lines and structures. The greeneries are exempted from all naturalness through the conversion into black and white. In this way the plants are reduced into the most minimalistic elements – pure lines. As a result the pure form of plants are highlighted and revealed.